One of the most important issues to stress with new shooters who are learning how to shoot a gun is the aggressiveness needed to manipulate a handgun. 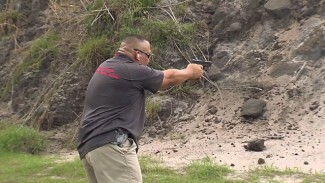 Defensive Firearms Coach Alisha Ketter explains why and shows how to do it. Many new shooters come in to their first handgun training session feeling timid. They don’t know what to do and they’re very soft with the guns. This is not the way to learn how to shoot a gun. 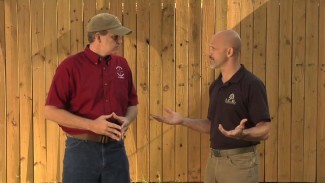 All shooting instructors should ensure that the new shooter has a strong and stable platform in terms of their body positioning and confident, aggressive movements when manipulating the handgun. The gun needs that to function. When the trigger is pulled, the gun essentially has a small explosion inside it that sends the slide backwards. If the shooter tries to cushion that blow, the gun will not cycle correctly. The shooter needs to give the gun a firm platform to push back against, meaning a solid stance and a firm grip by both hands on the gun. All movements need to be aggressive, whether you are conducting shooting drills or shooting in defense of your life. Another aspect of learning how to shoot a gun is that we need to be aggressive when inserting a magazine into the handgun and then racking the slide. Daintily pressing the magazine into the magazine well doesn’t work. The magazine needs to be seated well. The slide has to come back to compress the spring and chamber a round effectively. Doing it gently does not work. Alisha illustrates this by reloading the handgun with firm, powerful movements. Seating the magazine allows the gun to function, but you can’t easily put it in. You have to force it in, rack the slide, and engage the target. For the last four years, a lot of my classes have comprise of half women (sometimes by themselves – they’re husband/other didn’t want to come! Akkk!). This instructor is an INSPIRATION to all women out there that they CAN learn to handle a handgun safely, competently, and proficiently. Keep up the great work! I’ve purchased a lot of video sets from Personal Defense Network and this is a good reason why! Smooth reload but a nagging question. 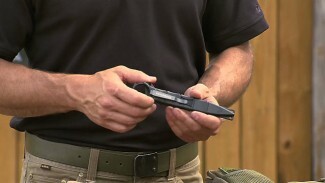 At the 1:09 reload mark, the individual demonstrating the reload, brings the magazine to the gun rounds facing backwards and then twists the magazine forward before inserting for the reload. Is this just their style or am I missing something? The reason the bullets are backwards is a combination of carrying magazines with bullets forward and the first motion of dropping the elbow after drawing the mag out of the carrier. She then needs to rotate the magazine to complete the reload. Carrying bullets forward requires a twist of the magazine to get the bullets oriented forward in to the gun. 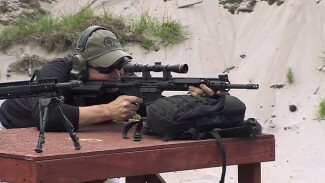 The way most are used to seeing this accomplished is by twisting the magazine and dropping the elbow at the same time while bringing the magazine around the body to the gun.